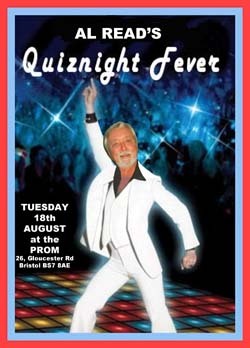 Once every couple of months Al Read is the quizmaster at the Tuesday night pop quiz at the Prom music bar. It’s always a fun night out and I’m sure you’ll enjoy taking part. It’s just £1 each to enter and you can make up a team of up to 6. Identify the music clips, answer the music trivia questions and fill in the title or artist blanks on the quiz sheets. There are cash and goodie prizes (not only for the clever clogs but also for the team that comes last!). 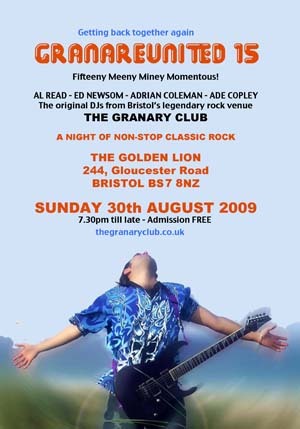 Al and Ed invite you to the next Granary reunion evening on Sunday 30th August when original Granary DJs will spoil you with non-stop classic rock just like they did at the Granary Friday night rock discos back in the 70’s and 80’s. Our new home at the Golden Lion will be decorated with Granary memorabilia and both the Granary book and Granary T-shirts will be on sale at special sale prices. Admission is FREE and, as the next day is a Bank Holiday, you’ll have plenty of time to recover!